Yesterday, we reached the “turning point” of my novel, The Labyrinth of Klavdia Klangfarben. Most stories have one moment in their progress that can be described as “the point where the story turns,” having developed from the initial material (the “exposition”) and now proceeds more purposefully toward an eventual resolution. While such plot-points are different from “the climax,” very often we are told these occur at or about the “Golden Section” of the novel, a division which occurs frequently in nature and is often used consciously or subconsciously in architecture or art and can be used to describe, for instance, perfect proportions or the perfect face. And that is where yesterday's installment of The Labyrinth of Klavdia Klangfarben ended: the Golden Section of the entire novel. How do I know this? Because I put it there. Simply put, whether it's called the Golden Section, the Golden Mean, the “Divine Proportion” or Phi (according to its Greek-letter designation, the way Pi refers to the ratio of a circle's circumference to its radius), it was defined by Euclid around 300 BC: "A straight line is said to have been cut in extreme and mean ratio when, as the whole line is to the greater segment, so is the greater to the lesser." Or that point where you can divide a line so that segment (a+b) is to segment a as segment a is to segment b. Like pi, this ratio is an irrational number which is usually described as 1.618. If you want to find the “Golden Section” of a line or a number, you multiply it by 0.618. Arguments are made for and against the idea this significant proportional ratio occurs – or almost occurs (in which case, it doesn't occur, does it?) – in such things as the various proportional subdivisions of the Parthenon's rectangle, or the ratios between the sides of Giza's Great Pyramid. 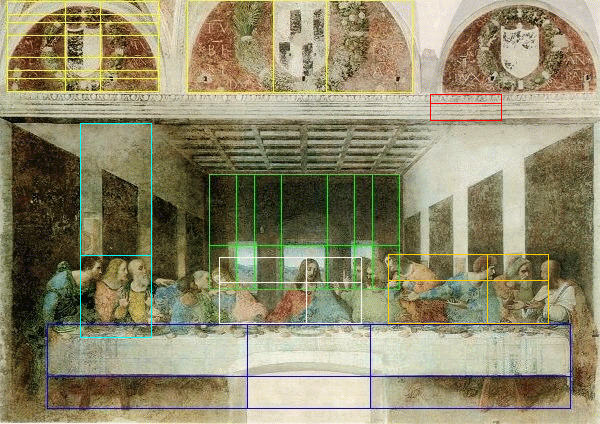 Unless an artist says he was employing the Golden Section, however, does the fact someone sees it or can measure it in a work of art become a significant fact of its creation or a natural coincidence? 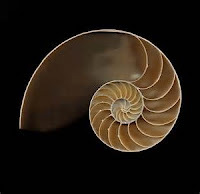 Certainly, it occurs in nature frequently enough – the famous nautilus shell; the way seeds spiral out from a sunflower's center – that its occurrence in art can be a human approximation of naturally observed patterns. At any rate, you can read more about it, for example, here; or here; or in Mario Livio's book, The Golden Ratio, here. I should point out, however, that's it not necessary to go into such detail to "get" what I'm writing about, in this instance. 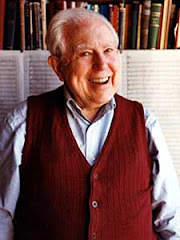 The Labyrinth is the final novel in a trilogy that includes The Doomsday Symphony and The Lost Chord. While this post isn't about what they're “about,” giving you a synopsis of each story – let's just say they're all “classical music appreciation comedy-thrillers” – it's more about a structural feature you may or may not have noticed. And it has nothing to do with whether or not someone may enjoy reading it (or not). When I began the first one, it started as a challenge. Now I'm finding it difficult to change. I admit it's tedious, a time-consuming procedure that I could easily abandon and rapidly increase the number of words I could produce in a day (after all, I have written 4,000-word posts in a day but sometimes find myself stuck trying to get 144 words in the novel). It's called a “cognitive constraint” – that is, a pre-ordained restriction rather than free-flowing creativity – which could be perceived as a “gimmick” or an integral part of the finished work, depending on how it was intended and how it is perceived by the reader. Poetic structure is a kind of “constraint” whether it's a sonnet or a limerick. A haiku, for instance, is a pattern of numbers, so many syllables divided in such a way in only three lines, though many people think they're creating haiku simply by writing three minimalistically brief lines with a kind of disembodied grammar. In the various coded messages in The Labyrinth that poor Frieda has to laboriously work out, I employ something children's writer Greg Pincus originated on his blog and called a “Fib,” based on the numbers of the Fibonacci Sequence (I'll get to that in a moment or three), though I used a number of words rather than syllables as he does. You may not be aware of this, but even Dr. Seuss's Green Eggs and Ham is an example of a writing constraint: he wrote the book on a $50 bet from his publisher he couldn't write a children's story using only 50 vocabulary words. I first read French writer Georges Perec in 1989 when I picked up a copy of his Life: A User's Manual where the odd structure of the book is based on the way a knight moves across a chessboard. Basically, the plot, if one can call it that, centers around a man who's spent his life painting 500 watercolors which he then has turned into jigsaw puzzles so he can spend the rest of his life solving them and thus recreating the experience of painting them (and then destroying them, leaving no trace of his life's work). He dies suddenly, almost completing the 439th puzzle, and the novel, rather than telling his story in a normal arc from start to finish, is instead a snapshot of everyone who lives in his apartment building at the moment of his death. The ordering of the individual stories, however, seems to have no consistency and certainly no continuity: instead, Perec superimposes on a diagram of the building's various rooms and their tenants a chessboard over which a knight, with its odd pattern, moves in such a way it will eventually land on every block without landing on any one twice. This is called a "knight's tour," actually only one of the constraints Perec employs, but let's leave it at that. When I began planning my dream sequence that is the opening Intermezzo: The House of dePaula Escher, I thought, since dreams are usually discontinuous and often non-consecutive and unresolved, unlike a standard straight-through narrative, I decided to map out in chronological order the different episodes of the narrator's dream (in this case, Dr. T. Richard Kerr, my main character in all three of these novels) and then superimpose on them a similar knight's tour to determine in which order they should appear. The challenge was how to proceed when some later events occur before earlier ones, and how to create some kind of transition from one to another and still maintain the semblance of a narrative arc in which the tension leads toward, as often happens in a real dream, a sudden interruption, leaving the story unfinished: in this case, Kerr simply is awakened at a key point. It is only later that some of these – the frequent sense one location is somehow familiar to him, especially the fascinating crystal globe at the bottom of Phlaumix Court's grand staircase – begin to make what might be perceived as sense. Or not. I have not, however, gone as far as Perec did in his 1969 novel, translated into English thirty years later as A Void. In this case, the constraint is he cannot use any word that has an “e” in it. This makes for some odd grammatical nuances and sometimes stylized-sounding if not downright stilted vocabulary – avoiding articles like “the” or pronouns like “he” or “she,” past tenses formed by adding “-ed” or substituting words like whilst for while. It makes for curious reading and I admit, barely getting 20 pages into its 300-page length, feeling more aware of the “gimmick” than I am of any story being told. Yet there are times the sheer virtuosity of it is sufficient to hold my interest but again at the expense of the story. I must admit, the Wikipedia entry for the book's plot synopsis is masterful in that it too contains no “e” but reads infinitely more naturally. In fact, if you'd read it first, I doubt you would've even noticed the constraint! So, what, you're probably not asking, was my constraint? In each of the previous novels, I had a pre-determined length – The Doomsday Symphony was going to be a novel of 150,000 words. Not about 150,000 words – exactly 150,000 words. But beyond that, the whole novel would be subdivided proportionally until each part of the book, each climactic point, each chapter, each paragraph, each sentence and even most phrases of those sentences would reflect the proportions of the Golden Section within those 150,000 words. I did the same again with The Lost Chord, set at 180,000 words. But with The Labyrinth, I wanted to use the Fibonacci Sequence and have the house where most of it is set – Phlaumix Court, one of those grand English manor houses like the fictional Downton Abbey – reflect the proportions of the Golden Section in its architecture, even (to the dismay of most everyone) the tiled patterns of the floors and the decor of the various rooms. It was even designed by an Italian architect named Philippo Nacci (“Fipo” for short), a pun on the name Fibonacci. In the case of Phlaumix Court, everything looks slightly off-center. If you look at da Vinci's Last Supper (above) and re-imagine it with the central figure of Christ being moved over to the Golden Section point to the right of center, that is how the different doors, fireplaces or stairs of Phlaumix Court might appear to the viewer. 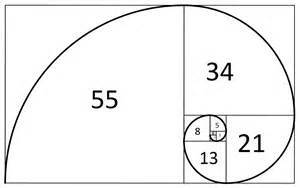 In that sense, it seemed perfectly natural to have the proportions of the novel reflect the numbers of the Fibonacci Sequence. Originating in a mathematical problem concerning the offspring of a pair of rabbits, this sequence begins with 1, again 1, then starts adding the last two numbers to arrive at the next, and so on. So, then, 1+1=2, then 1+2=3, then 2+3=5, 3+5=8, 5+8=13, 8+13=21 and so on. The numbers of the sequence, then, are 1 1 2 3 5 8 13 21 34 55 89 144... and so on. 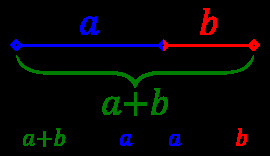 The relationship between each pair of numbers is similar to the subdivided line in the earlier illustration above: for the line 8, the division is 5+3, 5 being a and 3 being b. This dividing point is the Golden Section: not 4+4 or 6+2, each one another possible way of subdividing 8, but 5+3. Technically, the complete novel is divided into the “novel proper” and its preface, the seemingly independent short-story, an “Intermezzo” called The House of dePaula Escher. Therefore, the “novel proper,” The Labyrinth of Klavdia Klangfarben, is exactly 121,393 words long, a Fibonacci number if you continue the sequence to larger and larger numbers (it divides by the Golden Section at 75,025+46,368). Yet all of this third novel is overlaid by a unified structure where climactic points, chapter divisions and subdivisions, down to paragraphs, sentences and most phrases occur at various numbers in the Fibonacci Sequence. This tends to give a certain sense of rhythm to the structure: in a line (a+b), the a-section is longer, the b-section shorter. As the paragraphs and sentences become shorter – or “tighter” – there's a feeling of being propelled to a point which underlies the increase in tension or anticipation. And after the major climactic points, I insert something that gives us a chance to breathe, while postponing the resolution a bit. I noticed in several books I'd been reading how this rhythmic device would occur: you see it all the time in television dramas – they never take a commercial break in the midst of a ho-hum conversation between the characters; it's always after some build-up has been reached and you're waiting (“damn!”) to find out what it will be, making sure you're going to stay tuned through all those commercials for the resolution! These establish their own rhythm, beginning the process of building up to the next point-of-tension. Whether one senses that or not – that yesterday's post is the Golden Section of the “novel proper” – is not the point: like listening to music, you know that passage, that harmonic resolution might be the climax, but you have no idea it might or might not be the Golden Section of the movement or the piece since we cannot perceive time – and music is “sound-in-time” – the way we can perceive a painting or a building. But we can't read a novel and know “this is the Golden Section” unless you've looked at the last page and made your calculations – number-of-pages x 0.618 = approximate Golden Section. (And then, after all, the paging is fairly arbitrary, compared to what the author may have written). And certainly in a serialization like this, you have no idea when and where the end might (finally) come, since you don't even have an idea how many pages are involved. But it's there. I know it's there, like I said, because I made sure it was there! Frankly, it doesn't matter if you know it's there or not: it's all in how you perceive getting there and how the rhythmic build-up, the plot-tension and the overall sense of an arc reinforces that. It's not for you to reach this point and gasp “aha! it's the Golden Section!” when Frieda tells Dr. Kerr Toni is descended from both her twins (meaning the Old Gypsy's prophecy could come true and young Toni could grow up to be as great as her famous ancestor, Beethoven); but because you realize at this point something important has happened, something perhaps unexpected that begins to tie various seemingly unrelated plot elements together: the stories from Harrison Harty's journal in Book II and Knussbaum's Tale in Book III; what the murderer may have been looking for when various characters like Schnellenlauter have been killed; what Frieda's secret means; and how the Guidonian Hand may be involved in all of this. Not, I should mention, that all of those things point to the obvious solution... but it's where things tie together and from here, the tension builds toward the revelation. There will be more twists and turns to go. After all, we still have 46,368 words to go! Therefore, if you've been reading this novel at all, you've been reading lots of sentences where the word-count resembles [(8+5)+(5+3)]+(8+5) = a sentence of 34 words divided into two phrases of (21+13) words. Or some such configuration – sentences could be 13 or 21 or 34 or 55 words long, maybe 89 words or more; longer sentences are at the beginning of sections, shorter ones at the end. Phrases might “mirror” these subgroupings as (3+5) or (8+13), but the basic point is everything's divided according to the Fibonacci Sequence (there are sentences where an 8-word phrase is divided as 4+4 or 6+2, but any complete sentence fits the mold). And from there, they build to paragraphs and chapters and dramatic structural points. Trust me, there are many times when I feel “you know, a few words more would make this sentence so much easier” or “would anyone notice if this sentence had only seven words?” But having once started it, I feel part of the challenge is keeping it going. 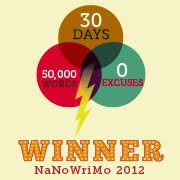 That I've written three novels already in “proportional word-counts” is enough to prove my initial point – yes, I can! – but yet, as I'm approaching the Golden Section Point of Novel IV, another adventure for Dr. Kerr and Cameron called In Search of Tom Purdue, I'm still writing according to the Fibonacci Sequence even though the location (the Philadelphia suburb of Marple) has nothing to do with visual manifestations of the Divine Proportion (perhaps it is best to leave Phlaumix Court as a building unique in its architectural style). So let us continue after the Golden Section with the continuation of The Labyrinth of Klavdia Klangfarben. Having reached the “turning point,” what would you expect the next chapter to be about?